Buy MagickDream Creations a coffee. ko-fi.com/magickdream - Ko-fi ❤️ Where creators get paid by fans, with a 'Buy Me a Coffee' button. 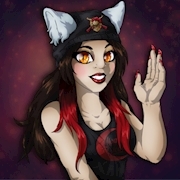 Zsadist ♑FemaleIllustratorGamerYouTuberTwitch Streamer☕ I am more commonly known as Zsadist or Zee of MagickDream Creations. I have been drawing since I was about two years old and it has become my life long passion! I also do Let's Plays and Speed Paintings over on my YouTube channel as well as live stream gaming on Twitch! Secured Payments. Support goes to MagickDream Creations's account. Upgrade MagickDream Creations to a yearly Gold Membership with a one-time payment.